We first met Duncan in August 2012 during our stay in the small village of Namisu. At the age of just twelve, Duncan spoke to us in fluent English, the range of his vocabulary would exceed most twelve year olds in England! He was a typical Malawian child, always smiling even though the circumstances and future prospects of his life looked bleak. The first time he greeted us he was pushing along a toy truck that he had managed to create by weaving multiple lengths of wire cable. A piece of bamboo was used to create a convenient handle running down from waist height to the bottom of the truck. The bamboo had been used to connect the wire to the small axel which linked to the bottle caps he had used for wheels, enabling him to control the steering of the truck whilst walking around. It was evident almost instantly that Duncan was an ambitious, intelligent young boy. However like most Malawian children, fighting poverty, Malaria and Aids is a common occurrence within Duncan’s community.During our stay at the guesthouse we had multiple visits from members of the local villages, each of which had problems unimaginable to people living in the U.K - access to food. Once word breaks out that the arrival of John Searle (founder of the AquAid Lifeline Fund) is imminent, members of the village schedule to visit the guesthouse in the early morning. Even before we had woken, people had already formed a queue outside. Malawi had suffered from a poor harvest and the number one commodity in the country, maize, was scarce amongst numerous families. Maize is a type of corn, Malawians blend the corn with water before crushing it with a large mallet to make a pasty substance called Nsima, many communities rely on this food source for survival in rural Malawi. One morning we had a knock on the front door, Duncan’s mother politely asked if she could speak to Mr Abuza, (The name given to John Searle by the Malawians – meaning Pastor). The requirement was food, like many others the harvest had been poor and providing for the family was becoming a huge concern. We agreed to provide the family with the essential food that they required, a cost of only £10 per month. Later in the afternoon Duncan returned to the guesthouse to meet us, oblivious to his mother’s previous concerns that starvation would become a reality for Duncan and her family. As energetic as usual , Duncan invited us to visit where he planned to build his home. Malawians take great pride in the creation and construction of their homes; however the men will not normally build their own house until their thirties. Duncan at the age of twelve had already started. The first picture of his efforts can be seen opposite, despite his hard work the foundations were one layer thick and the bricks were clearly uneven. Had we left Duncan to complete the house alone he would not have been living in it for very long! 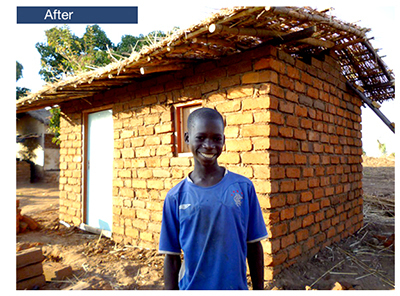 We agreed that starting from the next day we would help Duncan to reconstruct his home. The smile that quickly followed our offer was worth the several hours of digging the following day.It was our last full day of being in Malawi; thankfully it had been a lot cooler than the previous week. 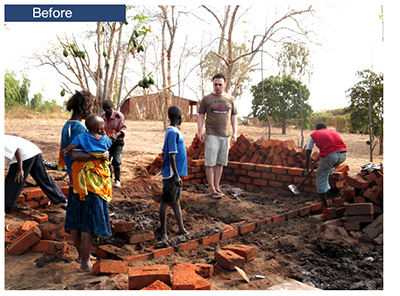 Duncan handed us his makeshift shovel and we got to work digging the foundations of his new home (Picture below). “The most uplifting part of the building process was the communitys’ willingness to get involved with theconstruction of the house. Girls between the ages of 3 and 6 were continuously filling water buckets the entire day, despite the weight and size of the bucket clearly being uncomfortable. However the most remarkable feat has to be Duncan’s grandmother mixing the mud to create a cement type substance. I am 22 years of age, been attending the gym regularly for the last three years and weigh about 80 kilos, but I had no chance of keeping up the same work rate as this lady! The technique used for mixing cement is fine for the first ten minutes, even half an hour but after an hour the soil becomes increasingly heavy and the job doesn’t seem as easy as it first looked. However, Duncan’s grandmother who must have been in her mid-fifties continued for several hours with only a mild sweat! Malawians are known for their laid back and friendly nature, often recognised as the ‘warm heart of Africa’. However I think my cement mixing ability was beginning to test this theory as every time I went to pick up a shovel someone would instantly take over and I was demoted to water gathering duties. After just one day we had managed to build the house to about chest height, whilst we would have liked to have witnessed the finishing result, our flight was booked for early the next day. We left Duncan with enough money to complete the construction of his home, including the labour costs for two builders. 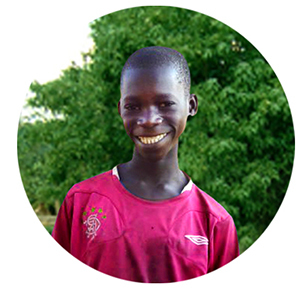 Please help us to reach our goal of eradicating poverty and help children like Duncan today by donating just six pounds a month. The Africa Trust does not incur any overhead costs, as these are all absorbed by AquAid Franchising meaning that every penny donated goes directly to the people who need it most. Thank you for this kind gesture.